The Poet’s Haven online galleries are once again open to submissions! For the time being, we will be using Submittable to manage submissions. This may change somewhere down the line (if we can find a secure, open-source alternative). Just click the “Submissions” link in the navigation above to see the guidelines and list of open calls. It was a tough decision, having to narrow all the great work published by The Poet’s Haven this year down to just six choices for nomination. What WILL be a bit longer in the finishing is the new submission system. I’ve only been able to find one open-source based script for this purpose, and it will need quite a bit of rewriting and customization before it can be used here. It also hasn’t seen any updates from its original author(s) in several years, which might lead to the same problems with it as what happened with the old Poet’s Haven galleries. If you know of any open-source (or other no-money-needed licensing), PHP/SQL based submission management scripts, please let me know. I would like something that works like the Submittable site, only installed locally (on this server) and without needing either an annual fee or for authors to pay to submit work. Work is progressing on rebuilding this website. There’s still a few cosmetic glitches to be worked out (the footer not being centered, the “Recent Posts” widget layout, those little grey corners around the navigation menu…), but overall, the site is finally starting to look the way I want. Now I must get to work transferring the pages from the old site. I’m more than half-way through transferring the Art Gallery (due to the file uploads, Art Gallery pages must be created one at a time rather than through a mass SQL import). The eBook Downloads section has also been completed (with the eBook release of “VENDING MACHINE: Poetry for Change volume 3” leading the way). After all the content has been transferred, the website will remain closed to submissions for a short time. (That’s website submissions, not print submissions, for which there’s currently four open calls posted.) I have not been able to find an automated submission process for WordPress that works the way I want. I am currently seeking a separate submission manager system. I would like something that works similar to the service offered by Submittable, only installed on this server and, y’know, free. I have found a free script that may be able to do what I need, but only after some massive rewriting. If anyone has any suggestions for other open-source submission manager scripts (PHP based), please let me know. Please be aware that randomly e-mailed poems will NOT be considered for publication. If you wish to submit a poem to one of the open calls, please send it to the proper e-mail address for that anthology. Poems sent through the “Contact Publisher” form will be discarded. The website’s new submission system will be up and running as soon as possible. Unfortunately, real-world matters do get in the way. Poet’s Haven is a labor of love, not a full-time income source. Once the website relaunch is complete, I will being scheduling new Author Series chapbook releases. I apologize for the delay in responding to those who submitted manuscripts during April’s open call. You’ll be hearing from me soon. Due to recent “upgrades” to the PHP programming language, the software that The Poet’s Haven galleries have run on for the past 13 years has been rendered inoperable. Since that software has not seen any new updates from its original author in the past decade, and rather than continue to struggle with depreciated PHP code every time the language is “updated,” the decision has been made to convert the site to WordPress. The publisher is working on this conversion as fast as his nowhere-near-professional programming skills allow. The Poet’s Haven Boutique bookstore is still fully operational. The page listing Open Submission Calls for upcoming print anthologies is also fully accessible. Please check back in a few days and see how much progress has been made launching PoetsHaven.com version 3.0. Recent “upgrades” to PHP have resulted in the software that operates the PoetsHaven.com﻿ online galleries no longer working. Rather than continuing to rewrite the software, changing everything that got depreciated in the latest round of “updates,” (the MyScrapbook program that has been the backbone to the site for many years now has not had any new updates from the original author since 2003), the decision has been made to move to a new CMS. While this won’t be another two-years-to-complete update like the site went through a decade ago (as I won’t have to manually create every page like I did back then, I can just reformat and import the database) (the site has more than tripled in size since then, by the way), I am having some trouble finding a new CMS that will function the way I need it to that has a large community of programmers behind it. WordPress is a leading contender at the moment, though it lacks a submission method that does not require users to use the control panel. (I have tried several plug-ins, none work the way I want. Allowing public registrations but having all new users be added to a group that has posts moderated will work, but takes readers out of the site and into the admin control panel.) I am currently exploring some other options. My hope is that I can have this all completed by early October. I do NOT want this to still be up in the air when Halloween rolls around. The plan to release season 3 of The Poet’s Haven presents… podcast series in October has been put on hold while this is worked out. Now seeking submissions for VENDING MACHINE vol.4! This is for the next “VENDING MACHINE” anthology that will be released at a special Stardust Poetry show on November 15th in conjunction with the Poetic Provisions food-drive. Patrons, poets, and other guests who donate to the food-drive will receive a copy of the book. Submissions must be received by October 13th! As this is a charity project to benefit the Poetic Provisions food-drive, we are unable to provide contributor copies. If sufficient copies remain after the release show, efforts will be made to get them into the hands of contributing authors who do not live in north-east Ohio that make a donation to their local foodbank. Authors retain the right to have their submissions published elsewhere, as long as the other publishers do not require first-time or exclusive rights. Previously published material is acceptable though discouraged. This anthology will also be published as a free e-book download in 2014. “VENDING MACHINE: Poetry for Change” is an annual anthology published by The Poet’s Haven and edited by T.M. Göttl and Vertigo Xavier. The book is not available for sale, but is instead offered in exchange for donations to the Poetic Provisions food-drive. To obtain a copy, bring a non-perishable food donation to the release show or to any Poet’s Haven event in December (while supplies last). Donations go first to the Canton Sunday Picnic, with any items they are not able to use going to the Akron-Canton Regional Foodbank. This year’s VENDING MACHINE: Poetry for Change event will be held at the Stardust Poetry show on November 15th at Karma Cafe in Canton, Ohio. So, apparently, somebody somewhere declared today World Cat Day. Tabitha would’ve disagreed, she would’ve said every day was Cat Day, then she would have demanded cheese from the refrigerator. None the less, you can celebrate World Cat Day by picking up a copy of “The Poet’s Haven Digest: On Velvet Feet.” This anthology features poetry, stories, and other creations about cats, starring cats, and possibly written by cats! It includes work from Kristina England, Joshua Gage, Janet Garber, Alex Gildzen, Clarissa Jakobsons, Paul Kahle, Thomas Koron, Lori Ann Kusterbeck, Geoffrey A. Landis, Marc Mannheimer, Michael Gillan Maxwell, Rachel M. Newlon, Angela Nichols, Jen Pezzo, Tina Puckett, Lady Kathy Smith, Kevin Frederick Smith, Steven B. Smith, J.E. Stanley, Hannah Stevenson, Melissa Studdard, Mary A. Turzillo, and Vertigo Xi’an Xavier. Or, if you’re behind on picking up Poet’s Haven books this year, you can now pick up the first eight books published in 2013 for a special reduced price with FREE SHIPPING! This gets you the “On Velvet Feet” anthology, “Letter to 20” by Alexis-Rueal, “Like Michelangelo Sorta Said” by Steve Brightman, “Back\words & For/words” by Lori Ann Kusterbeck, “Inside the Walls of a Blackened Book” by A.J. Huffman, “Inhuman: Haiku from the Zombie Apocalypse” by Joshua Gage, “Universe Gone Dancing: A Manic Cosmology” by Mark S. Kuhar (with art by Sven Geier), and “It Takes More Than Chance to Make Change” by John Burroughs for only $42.00! That’s like getting one book for free! Build Your Own Bundle Offer and Lake Effect Poetry 2013! BUILD YOUR OWN BUNDLE! Use the discount code “bundle” at checkout when ordering $25 or more in merchandise from The Poet’s Haven Boutique to get 20% OFF ALL POET’S HAVEN PUBLICATIONS and FREE SHIPPING on your entire order! Due to circumstances beyond control, Joshua Gage will not be able to feature at this coming Friday’s Stardust Poetry show at Karma Café in Canton, OH. His feature appearance has been rescheduled for June 21st’s show. Due to *other* circumstances not directly related to that, the release of Josh’s Inhuman: Haiku from the Zombie Apocalypse has also been delayed. The official launch will now be at June 21st’s show, but pre-ordered copies will ship before that date. I expect the book to be printed before the end of May. May 17th’s Stardust Poetry show will now feature storyteller and novelist Marcus V. Calvert and the poetry-and-music pairing of Ingrid Westberg and Emmanuel C. Bey! Marcus V. Calvert is a native of Detroit with a nigh-uncontrollable imagination. He’s been writing science fiction since he was eight. Even when life often got in the way, he couldn’t give up writing. In 2011, he released Unheroic, his first collection of short stories. Two additional short story collections followed, and now he’s working on his fourth book, a novel, to be released in fall 2013. His goal is to make up for lost years and to put out as many books as possible before he leaves this Earth. For him, the name and the fame aren’t important. Only the stories matter. Ingrid Westberg is an artist, poet, songwriter, and musician from Akron, Ohio, and Emmanuel C. Bey is the lead vocalist and songwriter of the the funk-rock band Full Effect. June 7th’s First Friday Poetry Spectacular will feature Mark S. Kuhar! Mark S. Kuhar is a writer, poet, editor, publisher, artist, and songwriter. He is the author of Acrobats in Catapult Twist (2003), Laughing in the Ruins of Chippewa Lake Park (2004), E40th & Pain: Poems from Deep Cleveland (2006) and Mercury in Retrograde (2012). He was a featured poet in the book Cleveland Poetry Scenes. He is the founder of the Deep Cleveland Poetry Hour (a live monthly spoken-word event) and is the proprietor of Deep Cleveland LLC, which includes Deep Cleveland Press and the Deep Cleveland Junkmail Oracle, a literary e-zine dedicated to the spirit of legendary outlaw poet, artist, and underground publisher d.a. levy. This show will be the debut of Mark’s newest book, Universe Gone Dancing: A Manic Cosmology. June 21st’s Stardust Poetry will feature John Burroughs and Joshua Gage. Joshua Gage is an ornery curmudgeon who graduated from the Low Residency MFA Program in Creative Writing at Naropa University. He has a penchant for Pendleton shirts, rye whiskey, and any poem strong enough to yank the breath out of his lungs. He stomps around Cleveland in a purple bathrobe and hosts the monthly Deep Cleveland Poetry Hour. This will be the official launch of Josh’s latest book, Inhuman: Haiku from the Zombie Apocalypse. John Burroughs is a north-east Ohio poet and publisher. He is the author of many chapbooks including Electric Company, Water Works, and The Eater of the Absurd. For around a decade, John served as a full-time playwright and occasional music director in residence for the Ministry of Theatre at Marion Correctional Institution. In 2007 he had a top-ranked blog on MySpace, after which John won the first poetry slam he ever competed in, formed the Poets of Lorain County, has contributed to the Cleveland Poetics and Ohio Poetry Association blogs, and is perhaps most proud of his work as the founding editor of Crisis Chronicles Press. This will be the debut of John’s latest book, It Takes More Than Chance to Make Change. The Poet’s Haven will be open to unsolicited chapbook manuscripts through the month of April, to be considered for publication in The Poet’s Haven Author Series. Manuscripts should be sent via e-mail as a file attachment. Attachments should be either plain text (TXT), rich text (RTF), or Microsoft Word (DOC / DOCX) files. Manuscripts should be between 28 and 36 pages in length NOT COUNTING title, copyright, dedication, or table of contents pages. Manuscripts containing full-color artwork may be shorter, 20 to 24 pages. One page can fit approximately 30 lines of poetry or 325 words of prose. If you have original artwork to be used as the cover, that can also be attached as either a JPG or PNG file. Please include your author bio either in the manuscript or in the body of the e-mail. The Poet’s Haven publishes more than just poetry! We are very interested in seeing fiction and art manuscripts! Simultaneous submissions are allowed, but please notify us if your manuscript is accepted by another press. Due to volume and real-world occurrences, it may take until December 31, 2013 for decisions to be reached regarding all submitted manuscripts. The Poet’s Haven will be participating in the book fair at the Columbus State Writers Conference this Saturday. Wick Poetry Center director David Hassler will be the keynote speaker. If going to AWP was out of your budget range or you were able to go but find yourself thirsting for more workshop experiences, this is the place for you to be. 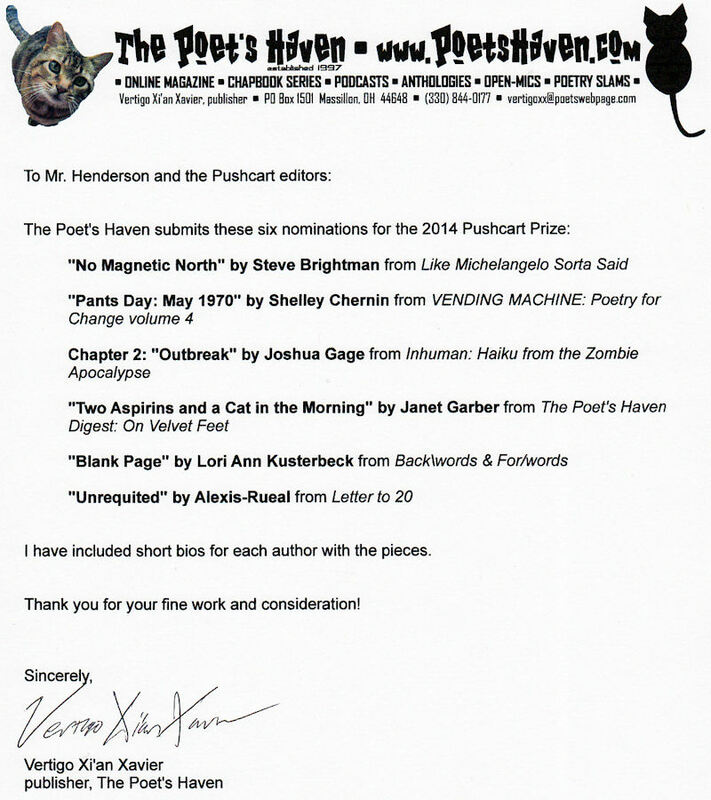 THIRTEEN YEARS in the making, The Poet’s Haven Digest #1 is now is available! “On Velvet Feet“ features poetry and stories by Kristina England, Joshua Gage, Janet Garber, Alex Gildzen, Clarissa Jakobsons, Paul Kahle, Thomas Koron, Lori Ann Kusterbeck, Geoffrey A. Landis, Marc Mannheimer, Michael Gillan Maxwell, Rachel M. Newlon, Angela Nichols, Jen Pezzo, Tina Puckett, Lady Kathy Smith, Kevin Frederick Smith, Steven B. Smith, J.E. Stanley, Hannah Stevenson, Melissa Studdard, Mary A. Turzillo, and Vertigo Xi’an Xavier.